Our exclusive 55-passenger shopping shuttle provides free seasonal round-trip transportation from Toronto’s Union Station to Vaughan Mills. The Vaughan Mills Shopping Shuttle operates between June 1 – September 30 and returns November 29 – December 26* for convenient Holiday shopping! Complimentary wi-fi is available on board the shuttle and throughout Vaughan Mills. Hop on board and come for a visit! *Daily shuttle available from June – August. Shuttle operates on Friday – Sunday only in September and November 29 – December 26. No service on December 25. Departs from 123 Front St. W at 10am and returns from Vaughan Mills at 3pm. Departs from 123 Front St. W at 1pm and returns from Vaughan Mills at 6pm. 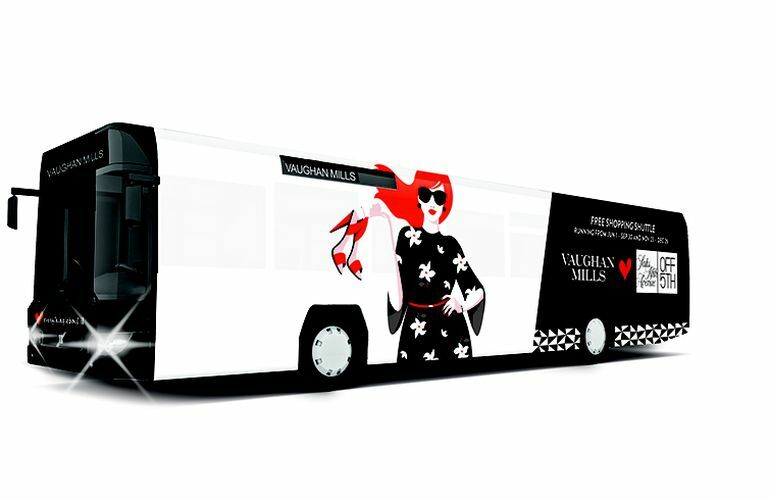 To reserve a seat on the Vaughan Mills Shopping Shuttle, simply register with the City Tours Attractions representatives near Union Station. Identification bracelets to ride the shuttle are distributed on a day-of, first-come, first-served basis beginning at 8:30am. Shuttle registration and boarding takes place at 123 Front Street West, on the south side of Front St., between York St and Simcoe St, and drops off at Entry 6 upon arrival at Vaughan Mills. City Tours. Please arrive well before the scheduled departure time to avoid disappointment. The safety of the passengers and drivers on the Vaughan Mills Shopping Shuttle is our top priority. We welcome families on board the Shopping Shuttle. Please note that babies and toddlers are the responsibility of the parent or accompanying adult and must be properly secured while travelling. Strollers are the responsibility of the passenger and must not block movement in the aisle. Umbrella-type strollers can be folded and placed in the overhead storage compartment on board the Shuttle. Larger strollers can be conveniently stored in compartments underneath the Shuttle. Service animals, including guide dogs, are permitted and welcome on board the Shuttle. Pets, however, are not permitted.